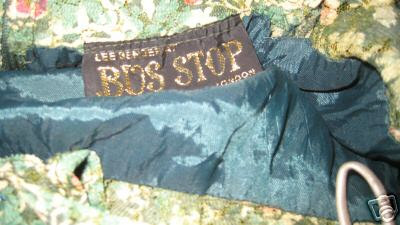 Lee Bender at Bus Stop is a very busy label at the moment-it is being sold and highlighted on Vintage-a-Peel.co.uk and there are some lovely pieces currently on EBay, too. I love Ossie Clark and Celia Birtwell, but I have a soft spot for Lee Bender at Bus Stop, too. I found this beautiful lace jacket at the boot sale last year. It has the label cut out, but I'm 99% certain it is a Lee Bender for Bus Stop piece-I stand corrected if I'm wrong, of course! 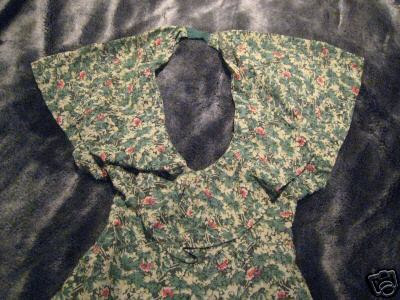 Reasons being are the dress above that was sold on Ebay, late last year, is in exactly the same print and material. My jacket is typical of the 70s styling- with balloon sleeves and fitted detail. It is also very well made. Oooh yum, I've been hankering after something in that fabric for ages - well done for spotting the jacket!!! Thanks, Miss Peelpants-I hope to build on this, as I don't have any other Bus Stop items! Thanks, because im addicted-for stopping by my blog!! It is an unusual top!! Hi! Having looked at the two photos I am fairly convinced that that IS my fabric! So glad you like it!